Create comfortable spaces with a balance of aesthetics and security. Suitable for traditional and contemporary environments, great for providing visual guidance as well as physical protection. Built ready to set boundaries, manage traffic flow and protect community assets, the Shoreline Series Bollards feature decorative bands offering a notable, upscale appeal. 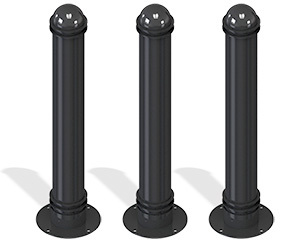 These 3' and 4' round bollards are finished in a resilient powder-coating and configured specifically for in-ground or surface mount installations.